Looking to thin out the stash of plastic shopping bags which have multiplied around your house? Don’t ignore the plastic mess, repurpose your plastic bags into a the hottest new green trend: Crochet and Knitted Plarn Bags. Plarn (plastic yarn) can be made from cutting plastic grocery bags into strips, and knotting the ends together. The finished plarn can be rolled into a ball and can be used for a variety of projects! Lately, there’s been a huge interest in plarn bags that can be made in any sort of shape or style. You’re only limited by plastic bag quantity and color. Think summer! Think rattan-esque beach bag for towels and beach essentials! Wet bathing suits? No problem! The plarn bag allows for easy drying and transport of swim gear. Since they are washable and hypoallergenic, you can wash out food spills with a little soap and water. 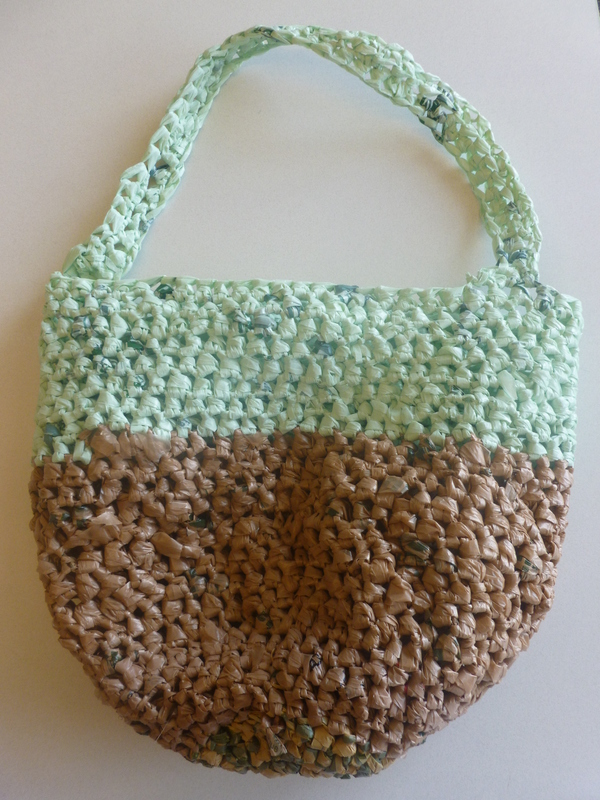 I picked up the idea for making a plarn crochet bag from the ladies at the FPLD Knitters and Crocheters Nest. Two ladies in the group have suggested using plastic newspaper bags, which are more colorful and can be easily collected from friends and neighbors. If the newspaper bags are too flimsy, you could double your plastic strips for durability. So if you know a store that carries exotic plastic bags, let me know where you found them! Have you seen any green plastic bags lately? Nest meets twice a week, 6 pm on Monday evenings and 10 am Thursday mornings. It’s a very social group, and everyone is very friendly and welcoming. At each session, people help each other on projects and swap ideas, patterns, and books. No registration required, just bring your project and enthusiasm! has some instructions for making plastic bags into sewable material. I have also heard of braiding newspaper bags to make jump ropes. Hmmm, something else to think about doing! I always have such worthy intentions. Here is the link for the full social software policy.